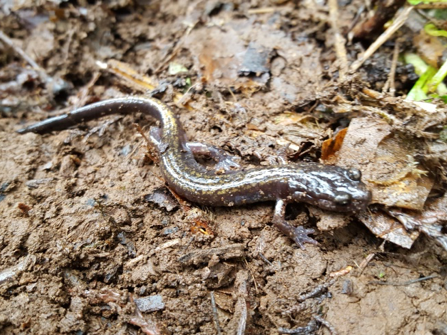 The following story was recently posted on the Northwest Natural Resource Group blog. For the full text of the blog including a story on tapping big leaf maple trees, click here. Lynn Baker and her partner Eve Lonnquist are members of the Oregon Woodland Co-Op, a group of over 70 private family forestland owners in Oregon. They’ve been selling bundled firewood through the Co-op since 2012. Lynn and Eve, along with Eve’s brothers, steward Cedar Row Farm—a 160-acre forest nestled in the Nehalem River foothills. The forest was purchased by Eve’s grandmother in 1919. Now, the family is returning their stretch of the Nehalem floodplain back to shade-providing conifers as part of a Natural Resources Conservation Service project. The firewood comes from Cedar Row Farm’s thinning projects and fallen trees from snow and wind storms. It’s turned into three types of firewood bundles: “Regular,” which is a mix of fir, alder, and hardwoods; “Kindling,” which is smaller pieces of cedar and fir; and “Premium,” which is a mix of hardwoods including oak, maple, and cherry. Lynn handles all of the firewood orders. Right now, about 20 grocery and hardware stores are stocking their bundles. Their vendors include New Seasons, Green Zebra, Gaston Market, and some Ace Hardware stores. 8.5% of the wholesale price of the firewood goes to the co-op for management and marketing, and the rest is passed on to the farmer. The regular bundle retails for about $7. “Our customers really like our firewood,” Lynn says. “If you look at our bundles next to other bundles, it’s really beautiful, high-quality product.” The quality of the wood isn’t the only attractant: the label on the bundle explains that Cedar Row Farm is certified through NNRG’s FSC© group certificate, which sets it apart from most firewood sold at grocery stores as being from a responsibly-managed forest. The label also includes the story of the farm, so buyers know exactly where the wood comes from, how it’s harvested, and who manages the forest. These humble chords of wood represent a win-win-win situation: wood buyers feel good about the responsibly sourced and hyper-local wood warming their homes and camp fires, Eve & Lynn take home around $7000 a year in profit, and their stewardship of the forest balances the multiple goals of recreation, income from timber harvest, and wildlife habitat in their forest. A full list of stores carrying Eve and Lynn’s firewood is available here. Eve & Lynn also sell chiminea firewood, available through Little Baja. Other products sold through Oregon Woodland Co-op include evergreen boughs, Canopy Essential Oils (created by another NNRG member, Jim Merzenich of Oak Basin Tree Farm, and Co-op members Neil Schroeder and Richard Hanschu at Oregon Forest Canopy) and Oregon Heartwood. ​The Stewart family will host the 2019 OWC Annual Meeting at their Raincloud Tree Farm south of Sandy, Oregon on Saturday, April 13. All OWC members and others interested in joining OWC are welcome to attend. Raincloud tree farm has been in the Stewart family for over a century. It was first homesteaded in 1889. It has been managed by Jon Stewart since 1973 utilizing a series of three carefully developed management plans. Over the past 63 years, the family has harvested over 2.6 million board feet from the 120 acre parcel. They currently have over 3.3 million board feet of timber growing on the tree farm. It consists of a variety of species including Douglas fir, western red cedar, western hemlock, broadleaf maple and red alder that range from four to 104 years in age. Relatively level, the tree farm is located on the Aims plateau above the Bull Run Watershed. It receives approximately 120 inches (or ten feet) of rainfall a year and is drained by two year round fish bearing streams. There are two family homes and a small log cabin on the property. They and the tree farm's timber stands are accessed by an all-weather road. Most importantly, Raincloud is the first small woodland property in the nation to be certified for carbon sequestration payments under California's new cap and trade legislation. Its owners are currently developing a new management plan in cooperation with the Pinchot Institute and Ecotrust to integrate carbon storage into its long term management objectives. We will enjoy a potluck lunch at Noon. Please bring a generous side dish, salad or dessert to share. OWC will provide pulled pork sandwiches for the main course. Turn S on Historic Columbia River Hwy. Look for the Tree Farm sign on right. ​Then continue a short way before turning left at the driveway immediately after the entrance to our tree farm. Then continue a short way before turning left at the driveway immediately after the entrance to our tree farm. We are hosting the event across the street on a neighbor’s property that has a barn and fields for parking. There will be folks directing arriving visitors. Please join us for what promises to be a most interesting and informative meeting. Amongst the many things that can go wrong with growing trees, I would like to take the opportunity to highlight two. 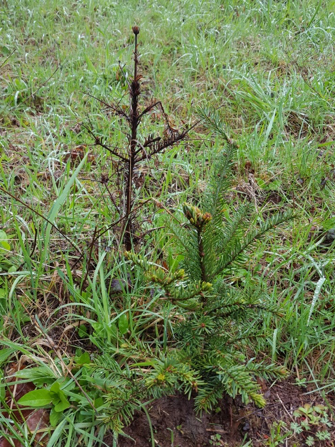 ​The first photo above shows a dead Noble fir (NF) seedling alongside its replacement. I planted about 50 NF seedlings early in 2017 with the intent of having a small patch of Christmas Trees for family and friends in several years. They all seemed to take well to their new home. Hence, I assumed they would need no attention over the relatively hot summer. However, they all died before summer’s end. My neighbor’s feedback was, “why didn’t you water them?”. I never have watered my Douglas fir (DF) and western red cedar (WRC) seedlings over my first few rookie years as a small woodland owner. With a wealth of resources as a member of both WCSWA and OWC, and with immediate neighbors having decades of experience, I failed to use those resources by falling into a mental trap of thinking 3 years of seedling planting made me an expert. In early 2018 I replanted 50 NF again, but now with the expectation to likely need to water them every week or so though the summer. If they survive the summer, then I may mount mesh tubes around them to improve their chances against the deer and elk. ​The second photo is a 12 inch diameter DF that snapped in heavy winds 15 feet above the ground. I am really good with the chainsaw …but this time better recognized the benefit of asking a few people with much more experience felling trees than me. My neighbor’s feedback was, “don’t take the risk …it will come down at some point on its own”. Another’s feedback was, “easy, do X, Y, and Z”. As much as I want to do X, Y, and Z, I decided that since this snag will fall in an area rarely accessed, and recognizing that I have never felled such a tree, to just give it time to come down on its own. There are aspects that are understood by all within my family about our property. Some came to us early. For example, it takes a great deal of work to even just keep things maintained, let alone addressing any desired enhancements. Another would be the trade-offs between modern conveniences, like Internet access speeds, and the rural life, like the amazing quiet. Yet one aspect that took some time to fully understand/appreciate was that we do not live on our property alone. We found bats living in the attic of our home, mice in all the outbuildings, elk amongst all the seedlings, back bear in trail camera photos, and coyotes breaking the evening silence. Early on we saw this as “man vs. nature”, but it has become “man with nature”. Wanting to be good stewards of the property has forced us to respect the overall health of the land …not just our future timber. Instead of picking photos for this brief article from a good stash of trail camera photos, I simply walked out of the house and over to one of our older tree stands and quickly/easily took the above photos. Amazing to be able to so easily observe so much life in/on/above the ground. Our compromise with nature so far has been to do what it takes to keep nature outside of our structures and from hampering our future timber from acquiring high market value, while letting them figure out the rest amongst the areas we do not disturb. One such area is along the creek the runs through our property, and another area is an old stand of trees from which we will never remove any wood. Another bonus for them is that we do not litter, burn, or use chemicals. The family member that takes over our forest management plan in the future will hopefully continue or better implement a “man with nature” perspective. Eve & Lynn bundling Co-op firewood. 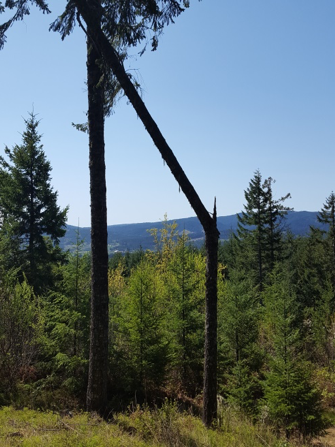 The family enjoys taking care of the land and balances multiple goals, including recreation and income from timber harvest as well as providing wildlife habitat. They are FSC-certified through Northwest Natural Resource Group’s group certificate and are members of the Oregon Woodland Cooperative, selling bundled firewood to grocery stores around the Portland area. As a new small woodland property owner, we need to acquire equipment to meet our forest management plan objectives. 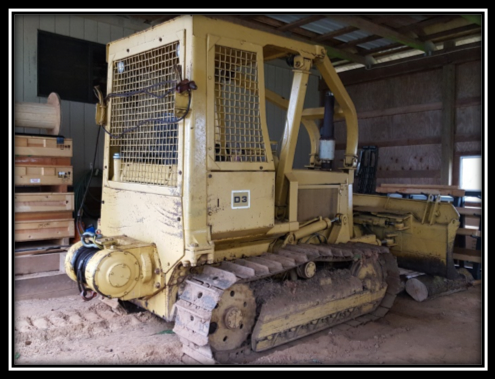 A recent bulldozer acquisition was an unexpected opportunity. It will greatly help us with road maintenance and be available for miscellaneous tasks (like some small logging operations in steep areas of our property). Three appealing features of this bulldozer are the following: 6-way blade; winch with steel cable (made later upgrade to synthetic rope); and a beefy cage/ROPS (RollOver Protection System). ​The bulldozer is a “nice to have”, but our log splitter has unexpectedly become a “must have”! It used to be so tough to get help splitting firewood. Now all I have to do is start the SuperSplit and the help just appears. No surprise that OWC wanted to be a distributor for SuperSplit …as well as for Logrite. Neither company has disappointed me with their quality products. Several years ago OWC helped to develop a market for essential oils derived from conifer needles. In 2012 the cooperative had a Woodland Fair at our tree farm where the process for extracting these oils using steam distillation was demonstrated. Together with my late friend Dave Bateman, I thus purchased a still. The process is to collect and grind the needles then run them through the still. The needle oil evaporates with the steam and is condensed back to a liquid. The oil can then be easily separated because it floats on the water. A one hundred and fifty pound batch of ground needles generally produces from 3 to 8 ounces of oil. We currently produce and sell oil from ponderosa pine, Douglas-fir, incense cedar, western red cedar, noble fir, and grand fir. This oil is sold under both the Oregon Forest Canopy label and our private Oak Basin tree farm label. When I thin and prune my conifer stands I am now collecting needles to run in my still. Oils are available for purchase online through Oregon Heartwood and at New Seasons Markets in the Portland area. A small firm in Eugene called Broom Magic makes and sells traditional brooms using real broom corn and nineteenth century broom-making equipment. The handles for these brooms are harvested from our tree farm and several other farms in Linn County. The handles are manufactured from 6’ long sticks that vary from about ½ to 2 inches in diameter. These sticks are cut in the winter when the plants are dormant and are then kiln dried with the bark on. Favorite species for handles are hazel, cascara, and cherry. While most sticks are relatively straight defects such as unusual crooks or animal gnaw marks can add character and value to a finished broom. We are paid for these sticks when we deliver them to the kiln. Other products such as bundled firewood, holiday boughs, and wood craft with the Heartwood label are now produced and sold by OWC members. I am in the process of training my 18 month-old pup to help me find and market truffles from our young Douglas-fir stands. Many other opportunities exist to derive added income from your farm. The Oregon Woodland Cooperative may help you find that niche market. Happy tree-farming and good-luck chasing your dream. My name is Roy Anderson and my "real" job is working as a consultant at The Beck Group (www.beckgroupconsulting.com). We offer a variety of services, but the bottom line is that we help people in the forest products industry operate their businesses more efficiently. In the summer of 2011, I was studying the feasibility of firewood manufacturing for a client and came across the Oregon Woodland Cooperative. ​I traveled to Forest Grove Oregon to meet with OWC president, Neil Schroeder, and firewood producer, Terry Howell. They demonstrated firewood bundling and explained that they had developed a good market at New Seasons stores in the Portland Metro area. It turned out that our client wasn't interested in manufacturing firewood, but I was so intrigued with the concept that I decided to join the fun myself and help OWC produce bundled firewood. I was soon introduced to Richard and Anne Hanschu, OWC members who helped me get started in the firewood business by providing a source of firewood. Richard and Anne own several properties west of Portland that total about 500 acres. I've worked with them on several thinning projects on their properties. During one of the early projects, we took some video of tree felling and skidding and then edited the footage into the short clip shown here. Many thanks to Richard and Anne and other Co-op members for their continued support of our family firewood business.